Ugh. It's like...officially fall and stuff. 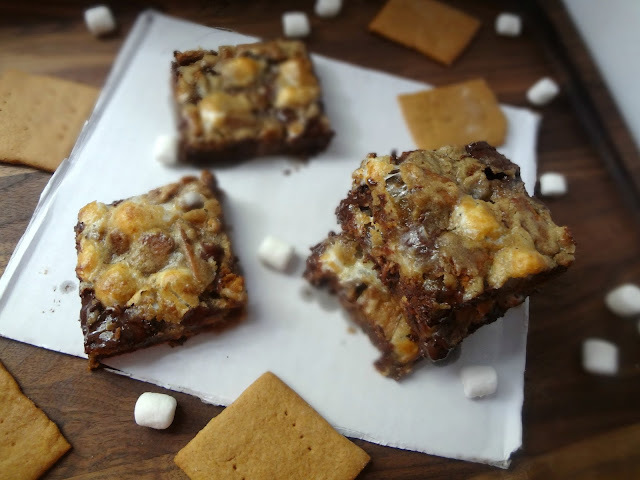 Seriously, though, I just love s'mores. Just thinking of them makes me happy. Literally, in the days prior to baking these I was just giddy at the thought. Michael had a sore throat and had read marshmallows helped...so he asked me to go buy marshmallows . And I was STOKED! Buying marshmallows means I'll have to use up whatever is leftover (which in this case meant the whole bag, minus 2), which means I have a valid reason to make some S'MORES DESSERTS ! Yessss! These are so good that, after a tiny bite of 5 day old bar, my cousin Emily said, "It's a good thing you're not my girlfriend because you'd definitely make me fat." (this was in reference to Michael's earlier claim of getting fat-which he's not, for the record) I'll take that praise. 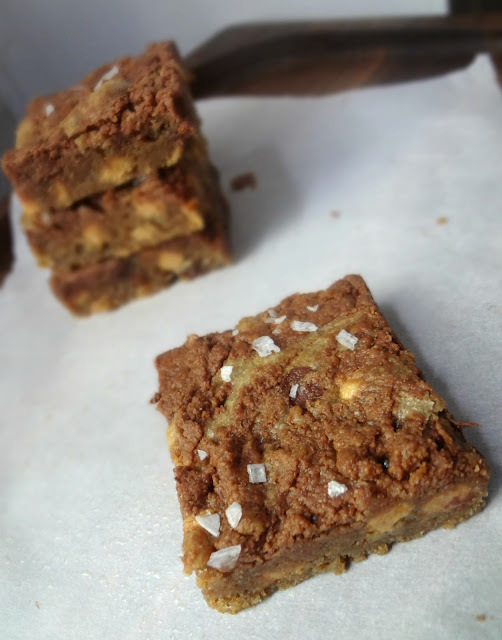 Now, I browned the butter in the super soft, chewy blondie base for these s'mores bars (because if I see melted butter, I'm gonna brown it) BUT you can totally skip that step. Honestly, you could barely detect a difference: there are pretty much more mix ins (graham crackers, chocolate, and marshmallows) than batter, so they definitely are the prevailing flavors. Regardless, you end up with wonderful soft cookies loaded with DELICIOUS pieces of graham cracker (prob. 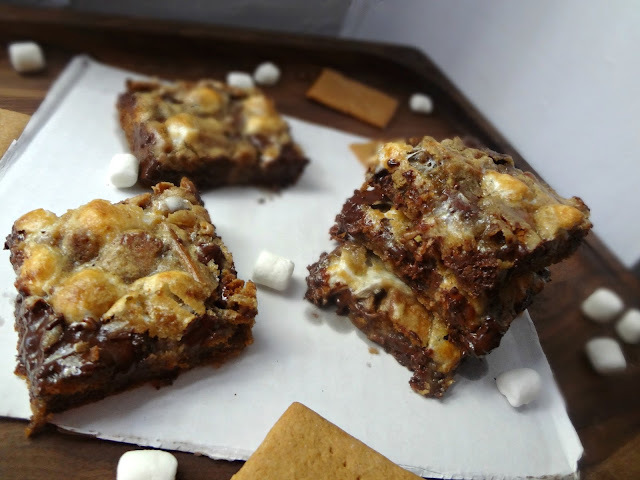 my fave part, I highly recommend homemade graham crackers), marshmallows that are gooey and have been toasted to a pretty golden brown in the oven, and gorgeous chunks of oozing chocolate. Oh and you just mix em up in one bowl -minimal dishes and no mixer needed, just a whisk and spatula ! S'mores are heaven. And they (almost) can make me forget that it's fall. Dexter-I am so sad right now. Also...I don't really understand why Dexter's now a lumberjack? And what exactly that ending meant? And how it seems to somewhat disregard all the emotional progress he's made (yes I get that he's staying away to protect his loved ones but still...)...I don't know. How I Met Your Mother-IT'S BAAAACK! I'm sad James is getting divorced, but I'm loving Barney and Robin. And anything and everything with the mother in it. Criminal Minds-WHAT THE HEEEEY??! Twins!? Who did what?? Also-grossness. Agents of S.H.I.E.L.D.-Normally this would not be my kind of show....but the fact that it's a Whedon show totally saves it for me. The occasional lines that let you know it's not taking itself seriously ("Sorry, that corner was just really dark, I couldn't resist. I think there's a bulb out." "Gramsie!" "Hi ho hi ho..." "Aww Bashful!" etc) We'll see if I keep watching it, but for now I'm hanging in. Law & Order: SVU-WHOA. I just....whoa. Parenthood-I.LOVE.THIS.SHOOOW! Everything about it is just...flawless. This is another case of Michael seeing something on the computer while I'm commenting on a blogger friend's blog, and him going "I WANT THAT." And seriously though, he very rarely asks for anything specific, so when he does I have to honor his request! Especially since this recipe is so eaaaasy. And...I could use some easy in my life right now. I'm like...just...so busy. I just got back a couple days ago from Ohio and now I'm here for a week (in which I'll be working, blogging, cooking, etc.) and then I go back to Ohio for Michael's cousin's wedding. Then when I get back I'm gonna have a bunch of stuff to catch up on and there is already work booked and a short film and....yeah. You get the idea. Seriously: people who work full time and go to school and/or have children...I just don't know how you guys do it. Mad props because I am just apparently easily overwhelmed. Thank goodness for easy dinners that please. It's seriously just tortillas and like taco ingredients layered and baked for a short amount of time. And apparently it's delicious. The boy is certainly a big fan. He especially liked it if it's had some time to cool-less messy I suppose? If you're busy too, let's just calm ourselves down and make some Mexican Pizza, shall we? It's National Potato Month! Plus um...I just got home...and am only home for a week before I go baaaack to Ohio again. So give me a break, I need an excuse for a round up. And I realized I uhhh....have like...a bunch of potato recipes. And I am not sorry at all. Nope. Potatoes are yummy. Get on board. So let's talk about something else then, hm? Ummm....I may have a problem. Like...a serious addiction. The first step is admitting it, right? 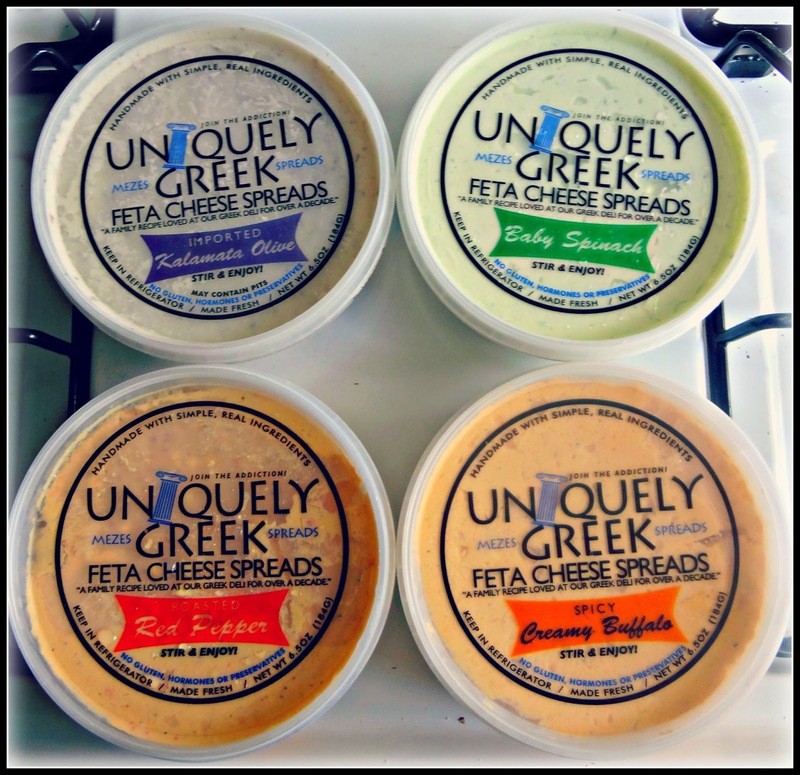 I, Kayle, am addicted to Uniquely Greek Feta Cheese Spreads. Uniquely Greek is another amazing find from my time at the Summer Fancy Food Show, and I CANNOT GET ENOUGH. 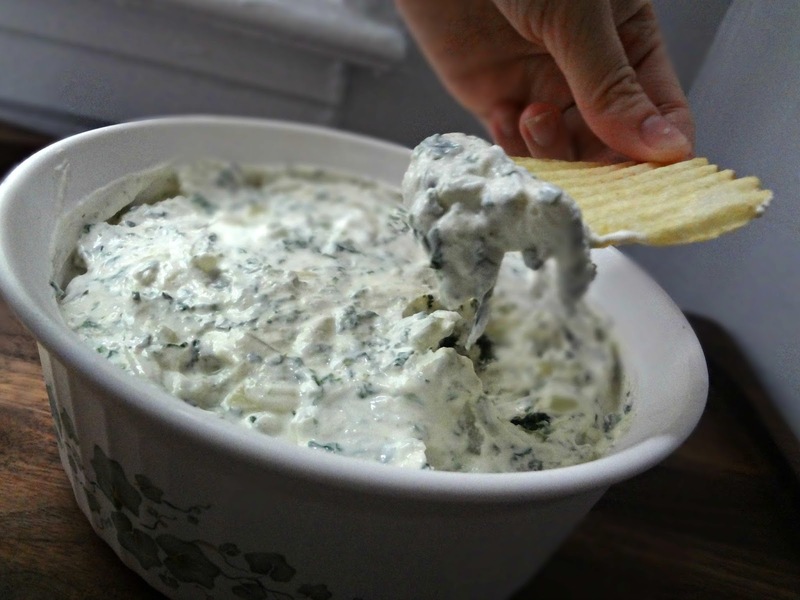 Essentially, it is a unique blend of domestic feta cheese, garlic, cream cheese infused with fresh produce. There are (currently) 4 flavors: Red Pepper, Creamy Buffalo, Kalamata Olive, and Baby Spinach. Kalamata Olive and Baby Spinach are MY FAVORITES! Now, technically these can be used as sauces, sandwich spreads, and all sorts of things. But umm...they didn't last long enough for me to do anything with them except shovel crackers full of the spread into my gaping maw. Seriously, I have a problem. I want MORE! If you wanna give em a try you can check out the "Find Us" section on their site, but essentially they're carried in 80% of the Whole Foods, Mid Atlantic (Specialty Dept) and just got into Whole Foods South. They're talking with NY distributors right now and will be available up north very soon. They're also in Earth Fare stores down south already (The Carolinas down to Florida) and in Chicago too at some specialty markets - over at least 150 stores and more coming every month. Exciting stuff! Also...Uniquely Greek people...if you're reading this....I would give my right arm for more dip. Check Uniquely Greek on Facebook, Twitter, and Pinterest! Disclaimer: I was provided with Uniquely Greek Feta Cheese Spreads to try, but I was under no obligation to review if I so chose. Nor was I under any obligation to write a positive review in return for the free product. My opinions, as always, are all my own. Alright! 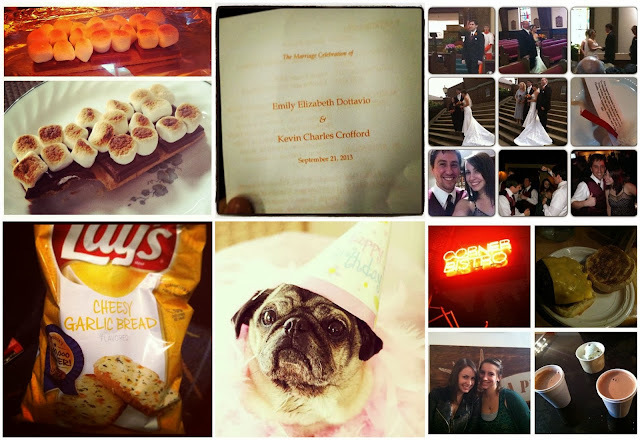 Today is the rehearsal dinner for Kevin (Michael's brother) & Emily's wedding! 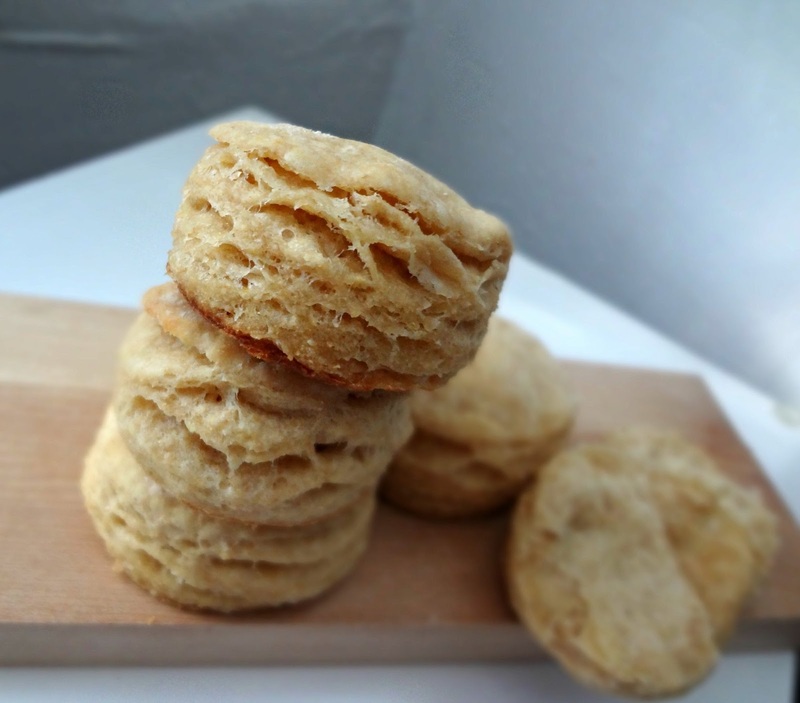 Also exciting is the fact that I'm guest posting at The Spiffy Cookie today! Erin, the super sassy, super brilliant, girl behind The Spiffy Cookie (speaking of which-how cute is that name? I literally started reading her blog for the sole reason that um...I love cookies. Yeahh) is working on finishing up her PHD (see, smart!) so she asked a few of her food blogging buds to help her out with some guest posts. Today that person is moi! 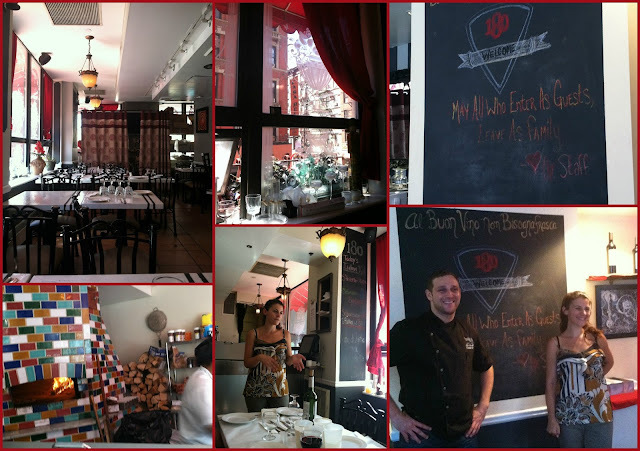 Erin and I were lucky enough to meet when she was visiting NY, along with a group of food bloggers who live in the area, and we had so much fun! She is just as adorable in life as she is on her blog. And her blog-if you don't follow it yet, do. Let's just say that sometimes she does weekly chocolate/pb posts. Uh yes. It's because she lived in Ohio for awhile (where, as you may know, I am from) and Ohio State and Buckeyes and pb/choc. Get it? Got it? Good. 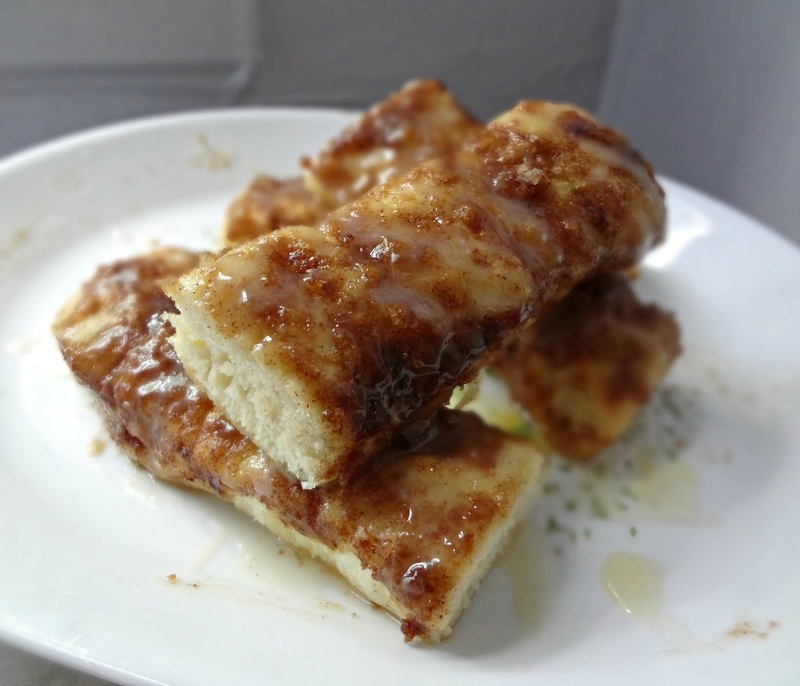 I decided to share these SUPER delicious, fluffy on the inside, crisp and sugar on the outside, cinnamon roll breadsticks. You'll never order cinnasticks from a pizza chain again. 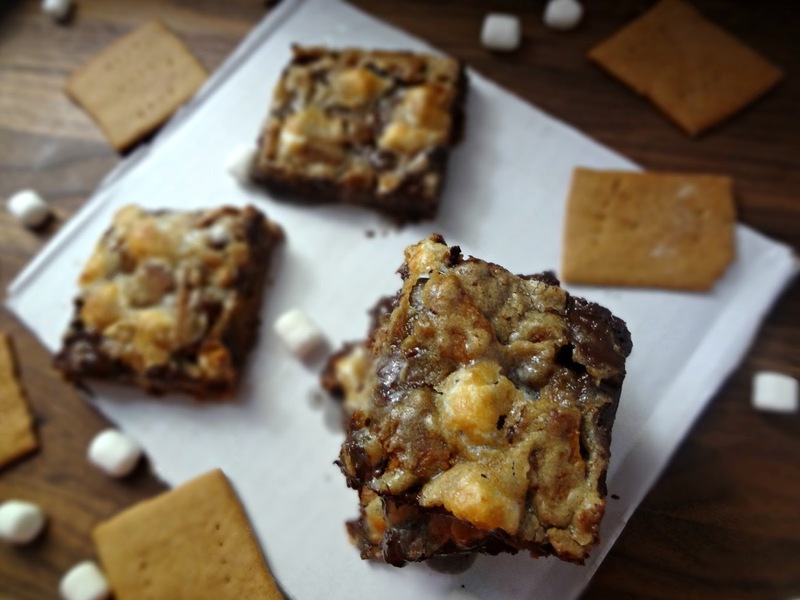 Click on over to her blog to read my guest post and get the recipe! Today I am on my way to Ohio, and Michael will be heading over tomorrow after work. This Saturday is Michael's younger brother (who is 1 year older than moi) Kevin's wedding! I know, crazy, I am SO excited! He and his fiance' Emily have been together for like ever and this is going to be my first time going to one of my peers' weddings. (I'm still at an age where none of my friends are getting married yet, and I actually haven't been to that many weddings in my life, so I'm excited!) Plus Michael is a groomsman so he's gonna be all important and wearing a tux and stuff. :) Michael flies back here on Monday, and I'll take the bus back on Tuesday. So...yeah. Don't worry, you'll still have posts to read while I'm gone, and I should still be arouuund, but yeah def. not as active as usual. Anyway. Back to the (post) birthday boy. Remember when he wrote his own post on the blog? Still laughing (and cringing). 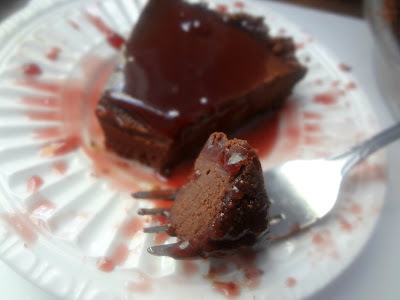 I remember what I made him for his first birthday here with me: Brown Sugar Roasted Chicken and Raspberry Ice Cream "Cake-Pie". 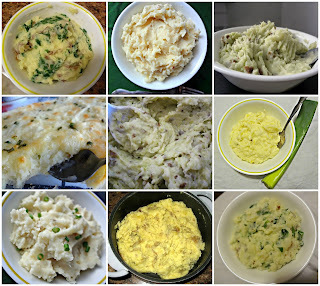 And last year's birthday's recipes and photos. 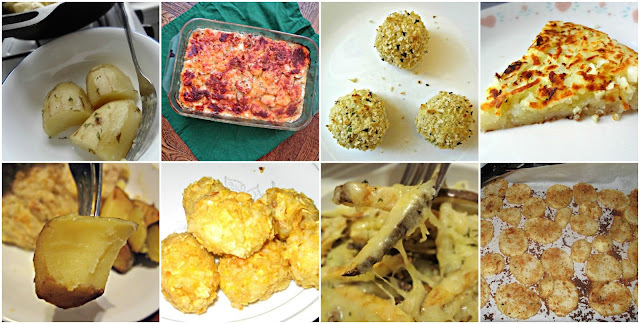 And my round up of Michael photos and recipe favorites. There's fancy, and then there's fancy. 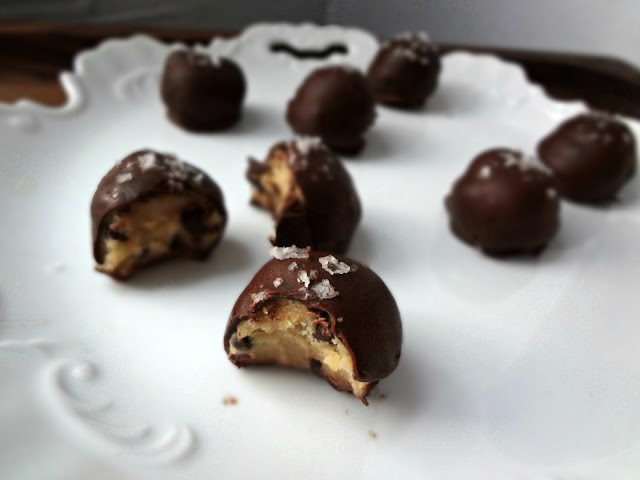 These truffles were pretty amped up to begin with but I maaay have taken them to the next level. Oh yeah. But I'm getting ahead of myself (as I've been known to do). Obviously, I love cookie dough. 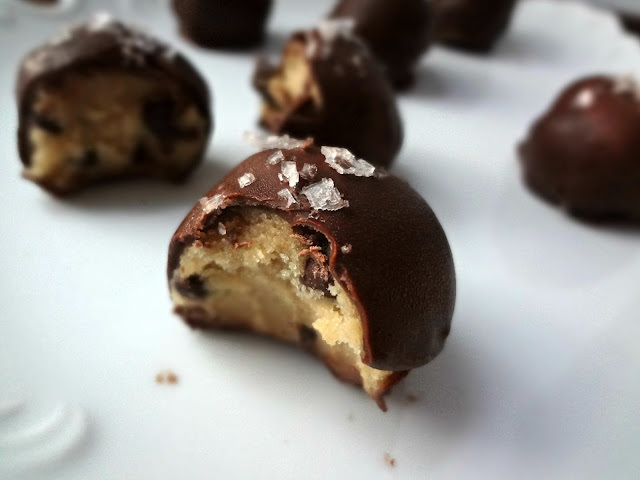 And I love cookie dough truffles. But THESE...are just like, in a league of their own. First...you brown butter. And that butter is not alone. Oh no. While you're browning the butter, there are also vanilla beans in there. If you think brown butter smells amazing...I can't even begin to explain how PHENOMENAL browned butter and vanilla beans smell. It's like...the best smell ever. I wanna bottle it. And wear it....of course then I'd be hungry all day...hmmm. 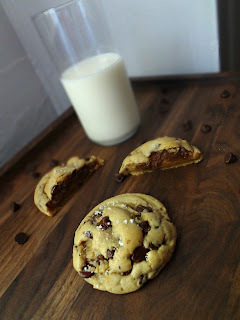 Anyway, then you make a fairly classic, eggless, chocolate chip cookie dough with that browned butter (and there's some heavy cream in there too...in case it wasn't rich enough before). BUT I added the delicious twist of, instead of chocolate chips, I folded TCHO's chocolate covered cocoa nibs into the dough. This was Michael's favorite part. And then you coat the little perfect dough balls in dark chocolate and sprinkle coarse sea salt on top. The first bite is....dare I say...foodgasmic (it's the best word to describe it). Just like...the most rich, sweet, salty, flavor explosion. I can't even get over how amazing these were. But, I was worried they'd be too much for Michael, that he wouldn't like them as much or something. But he totally fell in love too. His first bite, I could tell from his face, pretty much changed his life. And he loved the crunch from the cocoa nibs. And ever since, he hasn't been able to stop talking about them. Me either. Just...stop. Stop reading. 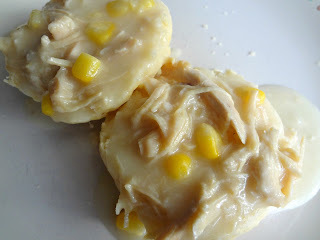 Run and make these. You simply must. Eep! Life is insane right now. But it's ok. It's in a good way. I'll be ok. *deeeep breaths* This week I spent a lot of time in the kitchen (and in front of the computer...and of course, working) and I'm feeling pretty good about that, because the next few weeks are about to be BANANAS. So...um...I guess it's football season? I dunno, my brother and facebook feed seem pretty stoked. I don't make a secret about the fact that I am not the kind of girl who likes or cares about sports (some people may say I cram the fact down their throats...I say that people who like sports try to cram it down mine so only fair). Here's the deal: where I come from...sports, especially football, is like...a huge deal. First of all the Midwest in general is super into the sport. Then, also, everyone knows how Ohio-ans are about Ohio State. Oh and Catholics love Notre Dame (my grandma, for instance). Oh and Canton (the city right next door to my hometown, where I went to high school) has the Pro Football Hall of Fame. Oh yeah and Massillon (where I'm from) has the longest running high school football rivalry (Massillon vs. McKinley)-is generally all about football (Paul Brown, of the Browns-as well as many other football players-went to Massillon's high school). They're so football crazy that every little boy born in Massillon hospital is given a football at birth. And here I am, this un-coordinated, uber-girly, just...not sporty girl. And people tried SO HARD to make me like sports, especially football, that all it did was make me like it less. So there you have it, a reason for my insanity. Now, all my personal dislikes aside, I completely support people's desire to be into sports. And even more so...I completely support the consumption of copious amounts of delicious foods at the parties, games, tailgates, etc etc. that go along with the sporty tradition. So, in honor of all of you-sports lovers and haters alike-let's eat some dip! I don't know if any of you care but...ya know...if you wanna avoid a football season gut...or I dunno maybe delay it or minimize it (? 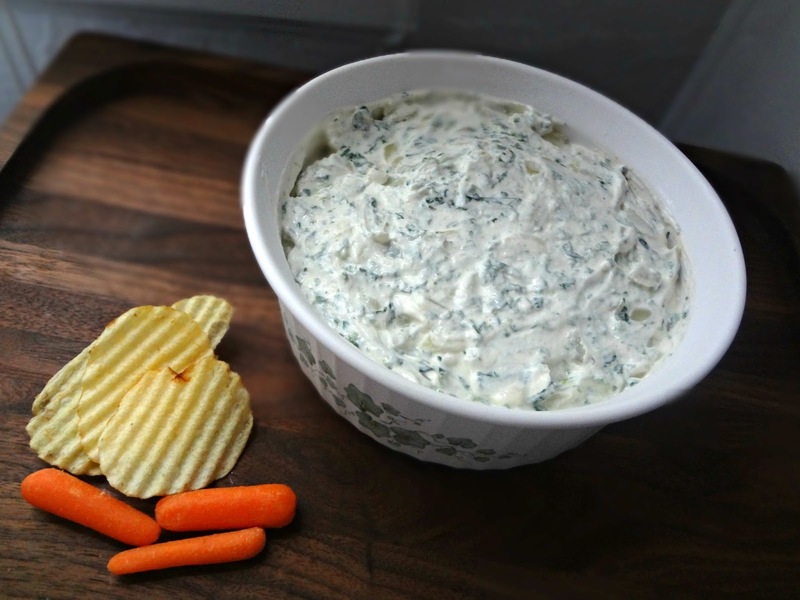 )-this dip has a little bit of a secret weapon: it's been lightened up. Funny story about this dip: I didn't love it at first. I thought it's onion flavor wasn't...well...onion-y enough. Michael wasn't a big fan either, he thought there was too much onion (he didn't like biting into onion pieces). So I speculated on ways to potentially solve this problem: obviously chopping the onions as small as possible buuut...I'd already tried my best with that (secret shame: I'm awful at chopping). I thought maybe I could puree the cooked onions? (I'm still curious about the idea). Regardless, there we were, with a TON of dip, staring at it and trying to figure out how we'd finish it. But then...something magical happened. I don't know if the extra time in the refrigerator made the flavor get more integrated over time or if it just grew on me but, um, I got addicted. Like...couldn't stop eating it. All the fears were for naught, I finished that bad boy in a few days. 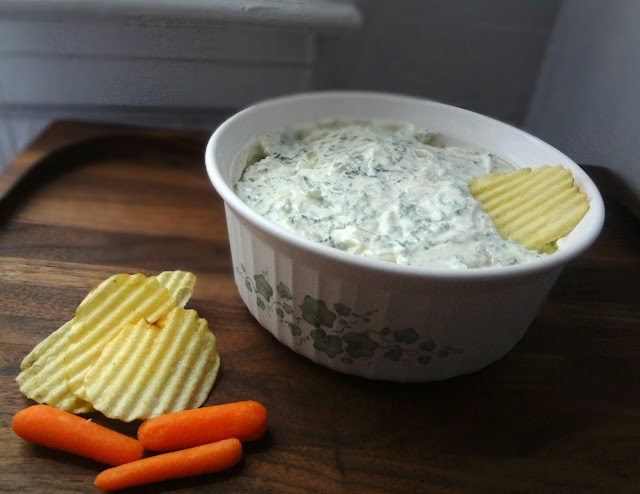 If you like sour cream and onion stuff you'll like this (even if it means you don't eat it until after it's sat in the fridge for a day or two :P) Trust me. Would I steer you wrong? That's right. Oh, hi, I'm Kayle....I like to over-complicate things. I have folders and files and tiny little details figured out for my wedding....and I'm not actually engaged yet. In that same vein...I will literally stress about and plan out things for a theoretical future that's not quite here yet. I have to explain my very specific orders to those poor waiters and waitresses at restaurants. Also...can I have water with no lemon? I see a recipe for something that's super easy, and I go "...but what if I made everything from scratch?" I see a recipe that already seems like it could have everything you could possible want and then I go..."maybe I'll brown the butter and put sea salt on top." You know what? I sort of love my brain. Sooo yeah....let's face it: if I see a recipe with melted butter....I'm gonna brown it. That's practically a given. 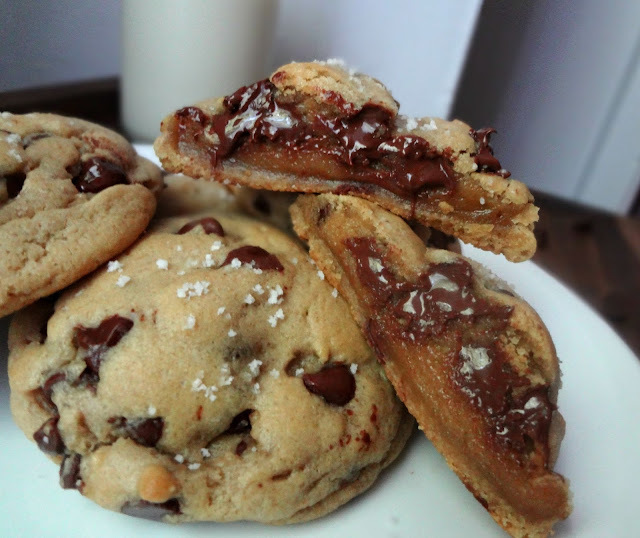 And I might be an eensy weensy obsessed with putting gorgeous big flakes of salt on top of sweet things. GUYS-it's just sooo gooood!! Do not knock it 'til you try it-it seriously just balances the sweetness in just the right way. Oh and I maybe used homemade nutella to "swirl" on top. Note the quotation marks because um...homemade nutella doesn't swirl too well....it's too thick. So these maybe aren't as pretty as they could be. But ya know what? I don't care because they taste FANTASTIC! 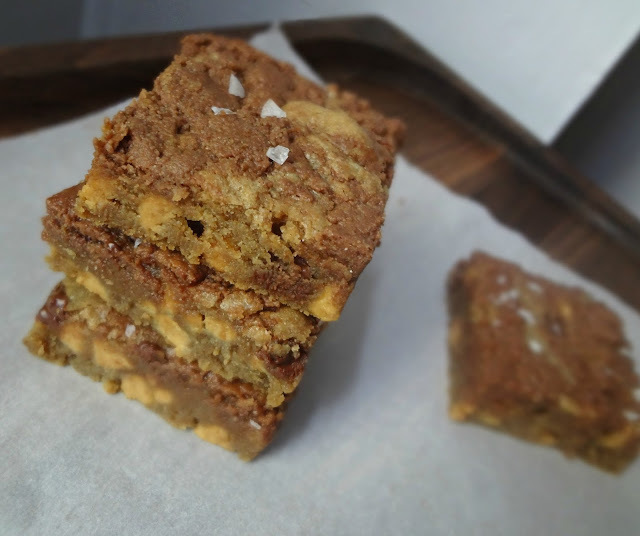 To sum up: a delicious, chewy, blondie base (with no white sugar, only beautiful beautiful brown sugar), made with browned butter. Then some chocolate and peanut butter chips are mixed in. Then ya put some nutella on top. Bake em up, sprinkle on some salt, and there you have it: a super complicated recipe. But here's the secret: not complicated. This whole thing is mixed up in one bowl (ok...not counting the pan you brown the butter in), whisked together (no mixer! ), and made and baked in like 30 minutes. So uh...yeah...turns out this is SUPER quick and simple. And obviously out of this world yummy, packed with all your favorite things. You like my brain now, too, huh? Uhhhh, wanna talk about chocolate? I was lucky enough to get a FANTASTIC array of artisanal Belgian chocolates from Guylian. And oh man....SO GOOD. We're talking creamy, luscious chocolate and the most amazing hazelnut filling. TO DIE FOR. Not only that, but the chocolates are seriously the prettiest I've ever seen. I already gave some away as gifts at a party and intend to put together a wine & chocolate Christmas present using that gorgeous already wrapped chocolate box you can see above. Guylian Chocolate Truffles: Ok, so these are marbled with 100% pure, silky smooth, milk, dark & white Belgian chocolate, filled with Guylian's signature hazelnut filling (the original recipe of Guy & Liliane, their founders). They slow roast and caramelize fresh Mediterranean hazelnuts in small-batch copper kettles and then crush and blend them with rich & creamy Belgian milk chocolate. And they taste like heeeaven. I'm so obsessed with that filling. Guylian Individually Wrapped Chocolate Truffles: These are exactly the same as the other chocolate truffles, but they're individually wrapped. 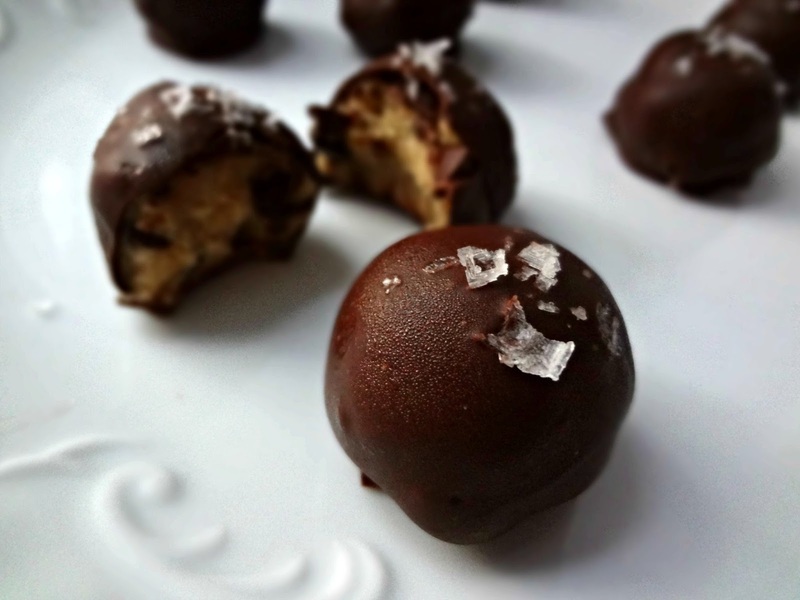 Which means you can take some truffles with you wherever you go! Hooray! Limited Edition Guylian Vanilla Cream Truffles: Marbled white & milk chocolate seahorses (so cute btw, and actually symbolic of a really cool cause Guylian sponsors, Project Seahorse), and filled with silky white chocolate vanilla cream truffle. I really love the vanilla filling, it just tastes expensive in the best way. Guylian Extra Dark Chocolate Truffles: These are hands down my favorite. Probably not surprising since I prefer dark chocolate. And I'm obviously not alone, they've been awarded the European Three Star Superior Taste Award 2010 and were recognized with a near perfect score for their intense and balanced taste, and lingering flavor. They have a 74% dark cocoa shell with Guylian’s extra dark chocolate truffle center. Like the original, this signature hazelnut truffle filling is made in small-batch copper kettles exclusively by Guylian Master Chocolatiers. Are you sold yet? Guylian No Sugar Added Dark Chocolate Bar (54% Cocoa) and No Sugar Added Milk Chocolate Bar: Ok, sometimes you wanna get your chocolate fix but maybe need to cut down on the sugar-these bars are your friend. 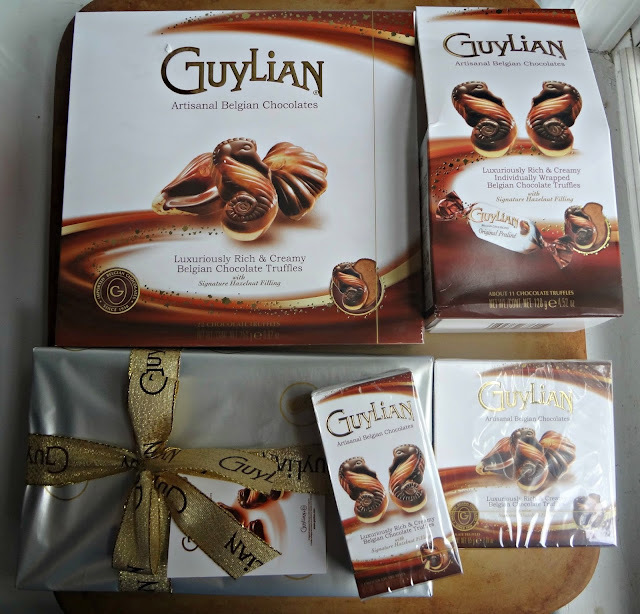 Yummy nummy Belgian chocolate without added sugar-Guylian guarantees these bars to have the same taste appeal as premium Belgian chocolate bars. They are made with Malitol, which is a pleasantly sweet alternative to sugar that doesn’t sacrifice taste. Sounds good to me! 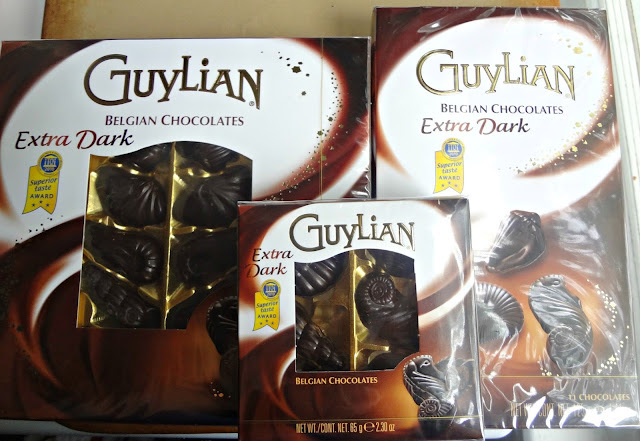 Now, what exactly makes Guylian Belgian chocolates so scrumptious? They're crafted and produced and imported from Sint-Niklaas, Belgium. Belgian chocolate uses 100% pure cocoa butter with a melt-point that allows the chocolate to melt perfectly in your mouth. Belgian chocolate is processed, known as conching, to a maximum fineness resulting in a dreamy, creamy chocolate texture. Belgian Chocolatiers strict adherence to true old world artisanal craftsmanship and time-honored Belgian chocolate-making techniques. And that's just the touching the surface on the exceptional quality of Guylian Artisanal Chocolates-to learn more about their quality click here. Now...you want some, right? Check out this link to find out where you can buy it. The winner is Janet, who said "I can't wait to try the no sugar added dark chocolate!! Completely guilt free!" CONGRATS JANET! I cannot wait for Supernatural to come back. Oh my goooodness you guys, I had the opportunity to do one of the coolest things I've done in my lifetime. The class was held in this adorable, authentic Italian restaurant in the heart of Little Italy. 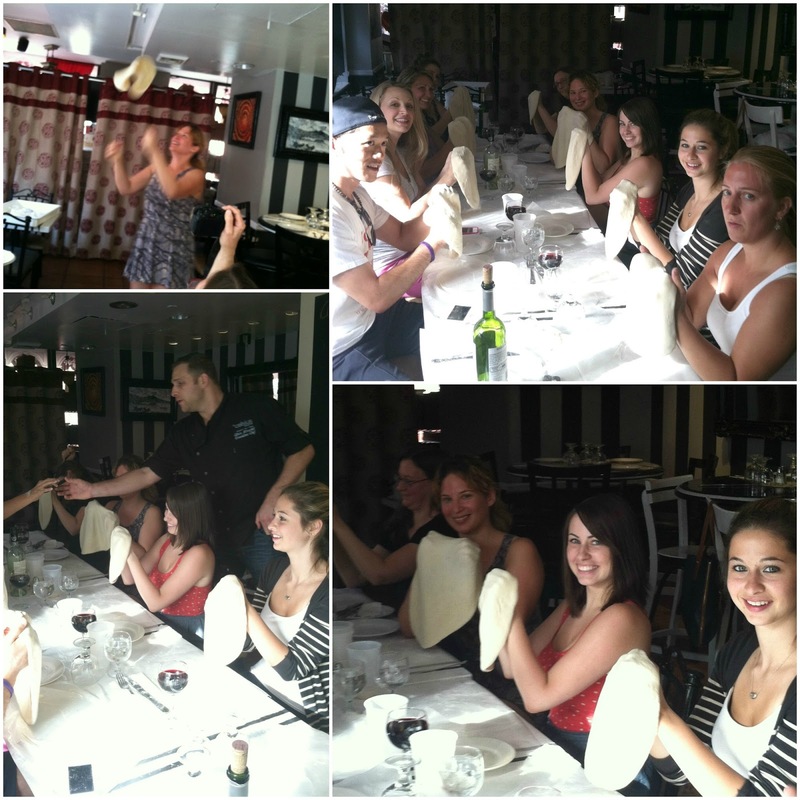 Our instructors were Nicole (a girl who's been raised on this stuff and trained in the best restaurants in the city) and Chef Chris Nirschel (Food Network's "culinary bad boy"...yes we all teased him about his nickname. He was super cool, and funny, and down to earth considering he's pretttyyyy famous lol). And there were 8 of us food bloggers (plus Phoebe) sitting down to learn from the masters all about the magical ways of Neapolitan pizza. 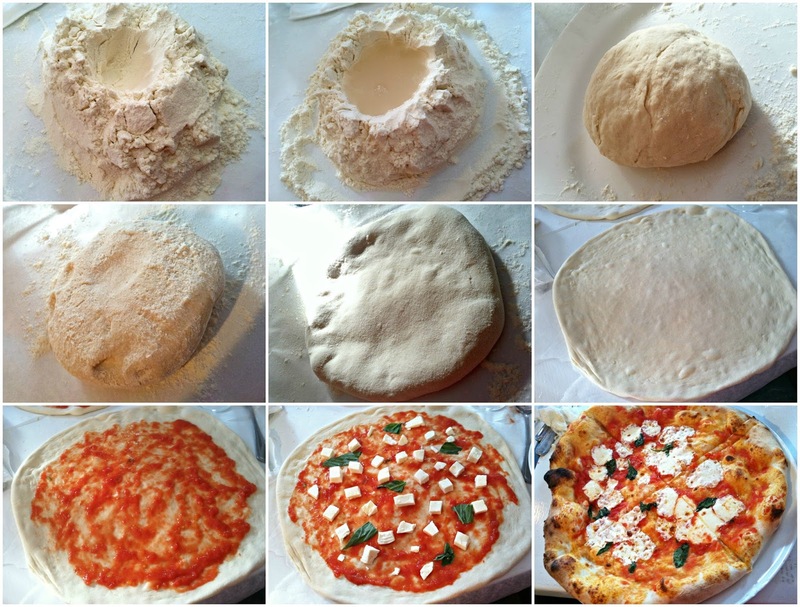 Fun tip learned: traditional sauce for the pizza is just some San Marzano tomatoes blended with basil. No cooking. Tastes so fresh and perfect! I've already done it at home and am in love with it. 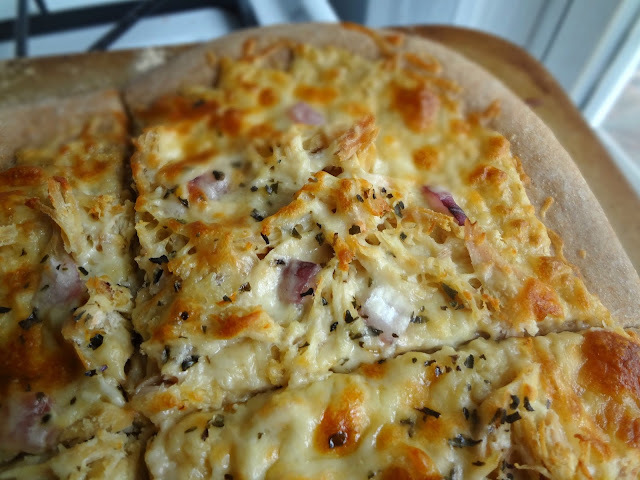 I'm generally not an adventurous pizza eater (Ok fine, I'm not an adventurous eater, period.) But like...I'm that lame person where, in a group setting, people are like, "Ok we want pineapple and banana peppers on this pizza, and artichokes and capers on this one...Kayle what do you want? "....just plain cheese please." I always choke out in the most timid voice. And when I'm making pizza at home, I'm no different. There's always a thin crust, tomato sauce (or at least tomatoes) mozzarella/Parmesan cheese, and some basil. That's it. 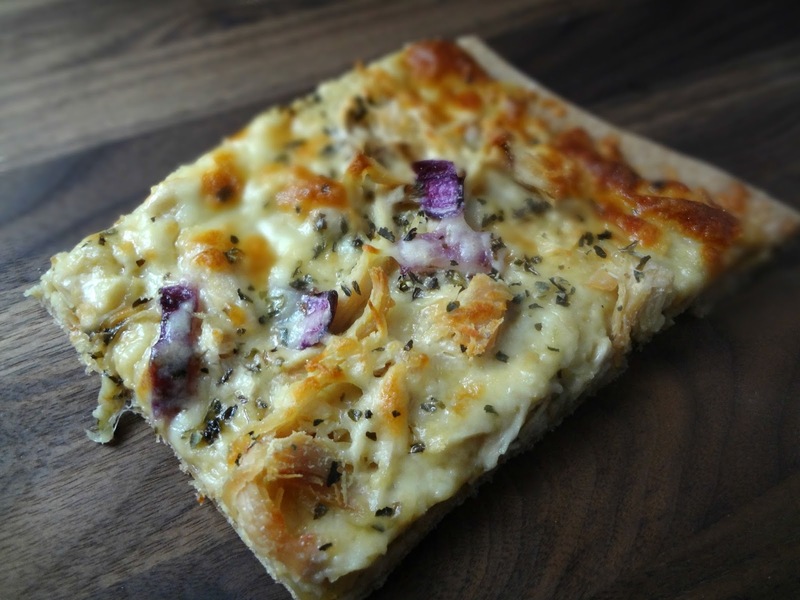 But this pizza, YOU GUYS this pizza is something totally different and so amazing and so delicious. Look at me, growing up. Anyway, I really don't know what's not to like about this pizza. 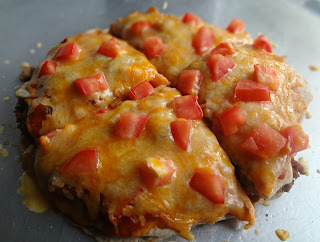 I used my favorite, whole wheat, pizza crust (you can use whatever crust recipe-or storebought crust dough-you prefer). We have a white sauce that essentially just tastes like garlicky goodness (and that I cut some calories on by using fat free evaporated milk). 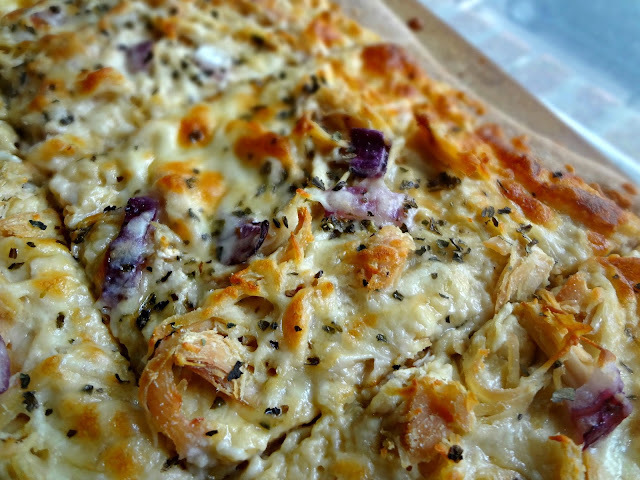 Then theres the goodness of chicken, cheese, and red onions. But really, you can def. 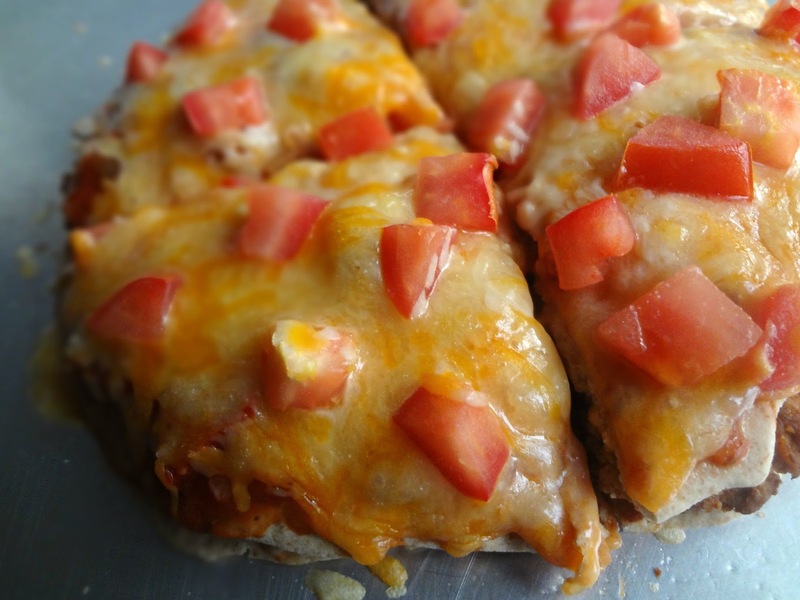 play around with toppings-as with any pizza. You can omit and add whatever your little heart desires. That's the fun! I want to tell you a story. Well....actually I want to tell 2 stories. 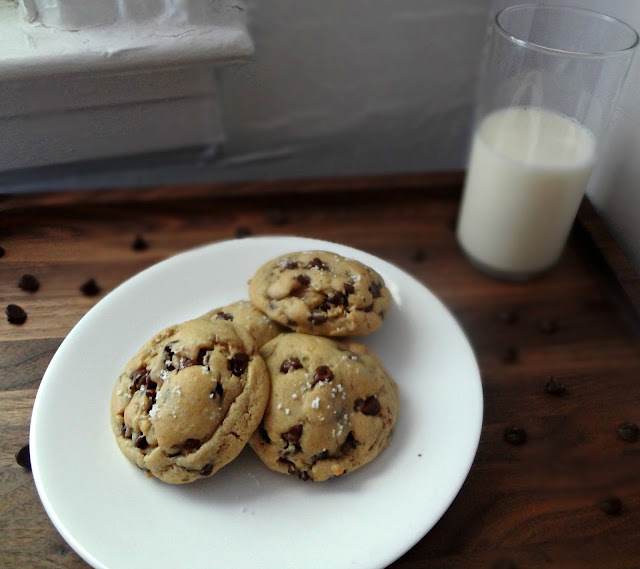 First story: These are my new favorite chocolate chip cookies. They're Michael's favorites too. Pretty much they're just the bestest thing ever. But more on that later. Let's get to the second story. You see, I feel like really good, big, bakery style chocolate chip cookies are sort of a city kinda thing. 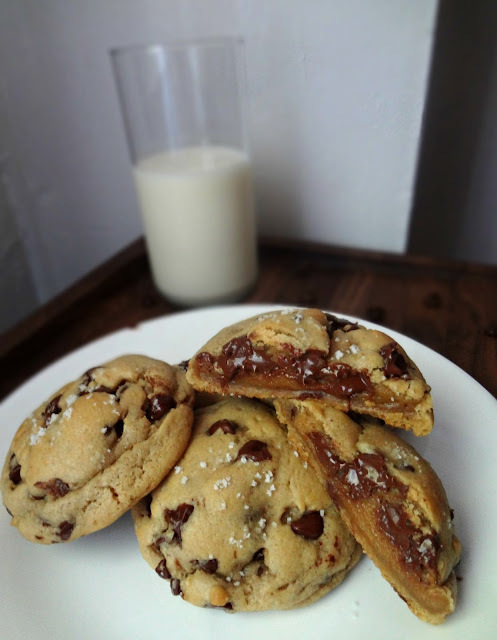 I certainly didn't experience these WONDERFUL kinds cookies until I moved from my small town in Ohio, to New York City. It's recently been brought to my attention that you all may not be aware of the tale of how I came to live here. I've been remiss. Let me fill you in. It all started my freshman year of high school. I was already decided that I wanted to be an actress, and I was fairly certain I'd want to attend acting school in New York City. But I'd never been. Every year, my high school would take a performing arts trip to NYC so, at the tender age of 15, I got my first taste of the big city and I fell head over heels in love. The lights, the hustle and bustle, everything at your fingertips-I knew that this was the place a high energy spazz like me needed to be. Fast forward to the summer prior to my senior year of high school: after looking at colleges/conservatories a few months before with my mom and brother, I had my sights set on the school I wanted. But I needed a little boost to get in. I was told participating in the school's (then known as SFT, later, when I actually attended, changed it's name to NYCDA) summer program would be extremely helpful to me. So, at the tender age of 17, I moved to New York City for a month. And it was a crazy, fun, dramatic, learning-packed month, and probably the longest month I ever had (it felt like a year!) I learned so much and, as a result, at the end of the program I was accepted into the 2 year conservatory, which I began August 2008, when I was nearly 19 years old. I lived in a dorm in Brooklyn Heights for my first year, and had the time of my life. A lot of things changed between then and now, I've lived in various places, made and lost many friends, finally learned the subways and my way around this huge metropolis but, that's pretty much the story. I've been here for 5 incredible, roller-coaster, years. And that's pretty much the story of how I came to live in New York. Anyway, back to the cookies. These cookies are huge, perfectly sturdy on the outside but oh so heavenly and gooey on the inside. 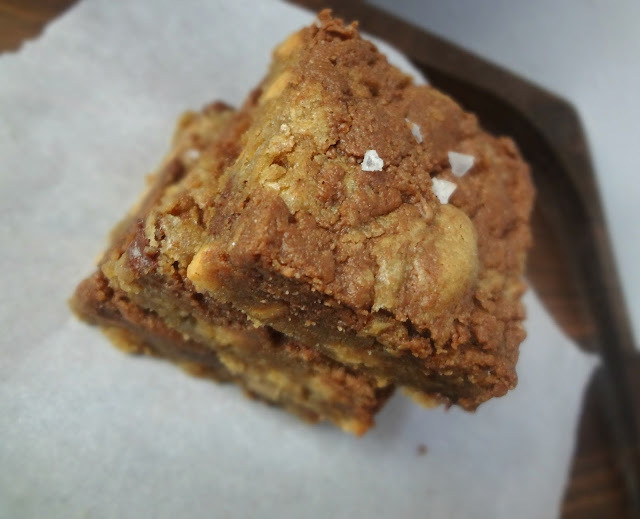 The flavor is INSANELY delicious-we're talking browned butter people. The mecca of all deliciousness. And maybe I sprinkled a little fleur de sel salt on top, ya know, because why not? Why not take the most delicious thing ever and make it EVEN MORE DELICIOUS! What's also amazing about these cookies is that they are sturdy enough to travel or ship or send or whatever, and they actually still taste great for up to a week leftover. Ya know...if you can keep 'em around that long. It's hard. Oh man. If you're on a diet...quit your diet. Eat these. Seriously. Life is for living, am I right? If (when?) I ever start a cookie baking business, you can bet these would be the go-to recipe for chocolate chip cookies. For sure. Definitely. I bow down to the prowess of Dorothy (Crazy for Crust). 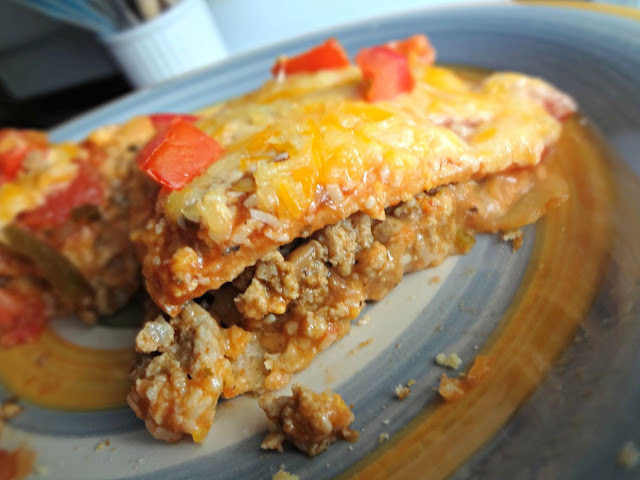 I love it when you try & want to share recipes you found here! Please just rewrite in your own words, use your own photos, & always link back to me! Thanks! Kayle Blogna. Powered by Blogger.